Do you ever have an irresistible craving for a dish you just don’t have the time or energy to make? It’s a problem I have quite frequently. Yesterday, after a long week of studying, I was craving some falafel. However, I didn’t feel like mucking up the food processor and frying falafel. 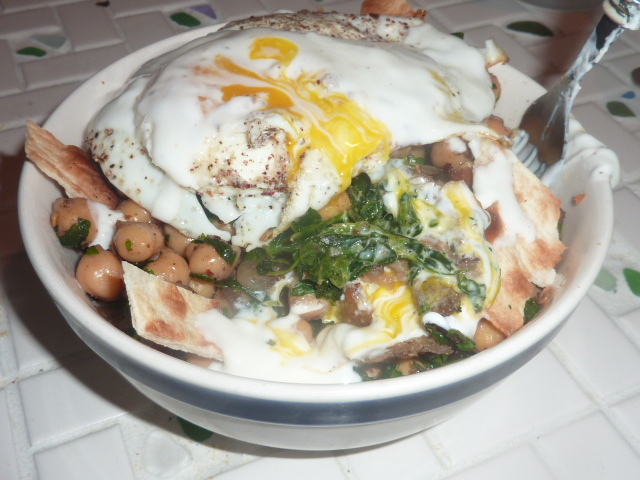 I decided to simplify the process by caramelizing some onions and garlic combining them with chickpeas, spinach, and cilantro and tossing it with a lemon and yogurt dressing and some toasted pita. I topped the whole thing with a runny fried egg to mimic the binder used in traditional falafel. I wasn’t sure how it would turn out, but I figured it’s pretty hard to make chickpeas taste bad. And, let me just tell you – wow! This simple dish had all of the flavors of a traditional falafel sandwich with less of the work. It was amazing how something that looked so different than a falafel sandwich could taste so much like one. I think the caramelization of the onions is what really knocked this dish out of the park – it added the depth of flavor that you would normally get from frying the falafel as well as a hint of sweetness that made the other flavors shine. This is going to be my go-to dish, especially since we almost always have the required ingredients hanging out around our place. In a 10″ cast iron skillet, heat 1 tbs. olive oil over medium heat. Add onion and garlic and cook over low heat until onions are caramelized, roughly 30 minutes. Add chickpeas and toss to combine with onions. Season with cumin, coriander, sumac, and crushed red pepper flakes. Add chopped spinach and cilantro and toss to combine. Tear up pita into small pieces and add to chickpea mixture. Cook, 3-5 minutes, until heated through. Meanwhile, heat remaining tbs. of olive oil in a small non-stick sauté pan. Fry an egg until over easy or desired consistency. Serve warm chickpea salad topped with egg and yogurt sauce. Gently whisk together ingredients. Serve over warm chickpea salad.